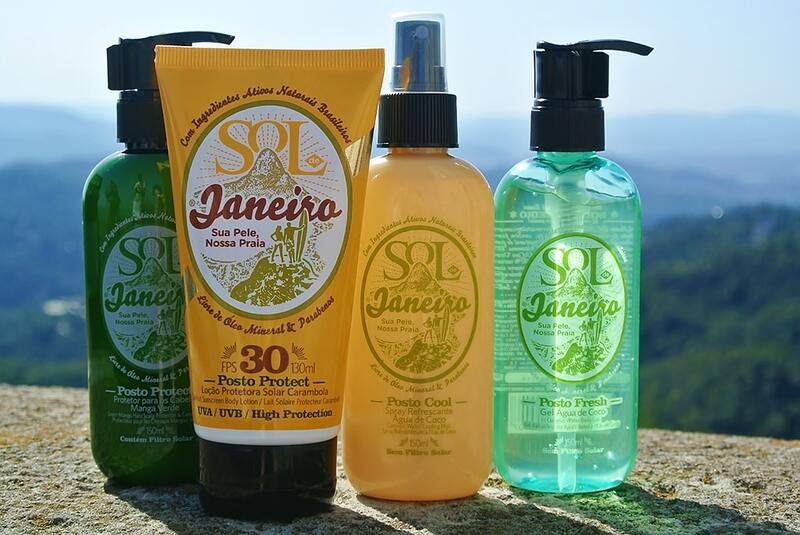 Sol De Janeiro – Sua Pele Nossa Praia According to their website, Sol de Janeiro was founded by a group of friends who share a passion for all things Brazilian. A group that collectively realized that in a country known for its beautiful people and their sun-kissed skin, that no one had developed a world class sun protection formula. A brand derived from natural Brazilian ingredients that provided safe, secure protection while moisturizing and restoring the natural beauty of the skin. Quite a good story huh? Well I was lucky enough whilst in Barcelona to be sent out a box of their products by the ever fabulous Brummells of London, who realised I’d probably get better use out of them here than in the UK. I got a whole mix of products – Starfruit Sunscreen Body Lotion SPF 30 / Mango Hair/Scalp Protector & Conditioner / Coconut Water Cooling Aftersun Body Gel / Coconut Water Cooling Mist. Each comes in a beautiful boxes and with gorgeous packaging as you can see in the photos, but as always, it’s what’s inside that’s important. I’ve never before read such a cultured ingredients list and I want to go into its ingredients a little more in depth, because I think I need to point out why this is better than the millions of sunscreens out there. There’s cultivated algae from Ilha Grande and Brown Algae from the North Atlantic, both of white aid in skin cell regeneration. There’s broad spectrum, physical, UVA/UVB and IR protectants that do offer a high level of sun defence. Cafe Verde , Açai, Cupuaçu, Castanha do Brazil are powerful anti-oxidants, keeping free radicals in check and your body protected. Natural Olive extracts provide the lotions silky finish and keep your skin soft. So in use. I was initially put off by the fragrance, I have to be brutally honest, and looking through the ingredients list, there’s a high ratio of it. It sank in well without leaving me feeling sticky and uncomfortable. After using it a couple of days spending more time than usual in the sun, I wasn’t burnt, left feeling dehydrated from the sun or pink and patchy. It was a very good sunscreen I have to say. In my experience, some sunscreens more easily sweat off or are actually worn away by the sun, and this wasn’t the case. Having very thick almost black hair, I’ve never had much problem with burned scalp, but my hair does easily dry and start to fade to brown in the sun. After using this for a week or so, my hair has retained its moisture, even from using hard Spanish water and hasn’t turned colour. My scalp is hydrated and there are no flakes which every so often I can get from the sun. My hair was not left feeling greasy and saturated, however it did make styling a little harder, but the weather here is so hot that any hair product sweats out after an hour of stepping out the house, so this wasn’t so much of an issue. This is really easy so sum up. I don’t like the fragrance, and it’s slightly sticky, but this is the best damn after sun gel I have ever used. Period. My main objection to the fragrance is firstly that coconuts don’t smell like this, but mainly because it’s a powerful insect magnet. Insects love high fragranced products and will bite the hell out of you as soon as you slart it on. I’ve been using this religiously and it leaves skin feeling amazing and with no dry and flaky patches whatsoever. It sinks in fairly well, but far better than lotions and butters. I find that if you keep this in the fridge, it’s absolutely amazing, and when it’s thirty degrees and you’re sweating out of places you didn’t know you had, this is pure heaven in a bottle. This actually smells great, and of exactly what it should smell like – coconut. This is great throughout the day as you start to feel a little nipped by the rays but doesn’t irritate the skin. The spray pump is great, generating a fine and abundant mist. If you push it hard enough, it’s so fine that it just sinks into the skin with no rubbing, but personally, I like to apply a heavy amount and really work it in. Again, keep it in the fridge over night and throw it in your bag as you leave in the morning. Applying it cool really helps. One thing I think worth mentioning is that it didn’t stain my clothes which is always something that plays on my mind when a product is designed to be applied throughout the day. The mist is invisible more or less and once it has sunk in, you won’t feel a trace of it, other than your skin feeling smoother and calmer. This article first appeared on MANFACE written by Thom Watson. It was published on Thursday 9th August 2012 and was last updated on Monday 3rd April 2017 at 4:13pm. It's categorised under Body, Brummells of London, Sol De Janeiro, Sun Protect, Sun Protect where you'll find more related content.